Locate the Heart of Transparent Law. "You remember where you hid the Heart of Transparent Law?" Ritemaster Iachesis remembers a woman's voice, whispering ancient words over and over. He thinks these words are tied to the place where he hid the Heart of Transparent Law. Before we breach the barrier, we need to determine what the words mean. "Tell the Ritemaster. It's a spell of retrieval." "Tell me when to unleash Dawnbreaker's power!" "Look, Mephala. The mortal hid the Heart inside his own body. How clever!" 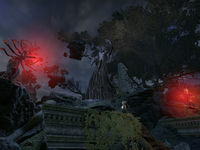 "Meridia's vessel. You have no power here." Speak with Oriandra and read the notes about the ancient language. Talk with Leythen who sends you to Ebon Stadmont with a projection rune. Read Grand Maestro Forte's Research and find the way through Ebon Stadmont. Interact with the stone to summon Leythen. Return to Artaeum and tell the Ritemaster what you've learned. Talk to Darien Gautier and return to the Dreaming Cave. Go through the portal to Evergloam. Scout your way ahead with Darien and talk with the Ritemaster every time the crows jog his memories. Head towards the ancient ruins at the top of the mountain. 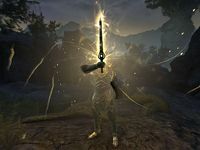 Defend yourself against the combined Daedric forces of the two Princes. Fight the Wraith-of-Crows and escape through Valsirenn's portal. Talk with Oriandra to finish the quest. The crows will have their say." Go through the portal with two crow statues, then the portal with one, and then the portal with three statues. I should return to the Dreaming Cave and talk to the Ritemaster about the memory he recovered. The Ritemaster asked me to go to his study in Ceporah Tower and check on Oriandra's progress in translating the ancient words. Oriandra has asked that I take the notes on this ancient language to Leythen. Showing them to him might convince Leythen to help us. 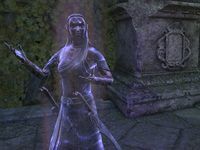 Oriandra suggested that Leythen could help translate the ancient words, since he was the Psijic Order's language expert before he left to join the Court of Bedlam. I should talk to Leythen in Valsirenn's study. Leythen provided me with a rune. He says if I use it in Ebon Stadmont, he'll be able to see what I see. I need to go to Ebon Stadmont, find the ancient writing, and use Leythen's rune. Leythen's rune has allowed him to project himself to my location. I should talk to him and see if he knows what I should be looking for. Leythen thinks the translated passages about crows will help guide me through the Ebon Stadmont forest. I should refer to the passages as I search for the stone inscribed with the ancient writing. This might be the area where I'll find the stone inscribed with the ancient language. I should use the rune so Leythen can assist me. I found the inscribed stone mentioned in the Grand Maestro's Research, but before Leythen could translate it, he was replaced by another member of the Court of Bedlam. I should talk to her. Leythen has reestablished his connection to the rune. I should talk to him. I need to return to Ceporah Tower on Artaeum and tell the Ritemaster what Nocturnal's earl revealed about the ancient phrase. The Ritemaster asked me to check on Darien and make sure he's ready to help us breach the barrier in the Dreaming Cave. Darien's ready. Now I should head into the Dreaming Cave and meet up with the Ritemaster. Darien removed the barrier and opened the way to wherever the Ritemaster hid the Heart of Transparent Law. I should enter the portal and see where it leads. Now that we've emerged from the Dreaming Cave portal, I should talk to the Ritemaster and see if this place triggered any of his missing memories. The Ritemaster was weakened by the effort of opening the portal in the Dreaming Cave. He asked me to scout ahead and clear the path while Valsirenn helps him follow after. The crows seemed to recognize the Ritemaster. I should ask him about that. I should continue to scout ahead and clear the path for the Ritemaster until we find the Heart of Transparent Law. The crows said something about an offer from their mistress. I should ask the Ritemaster if he knows what they were talking about. I need to continue to scout ahead and clear the path up the mountain so we can find the hiding place of the Heart of Transparent Law. We reached the top of the path and it's a dead end. The Ritemaster seems to have remembered something important, though. I should talk to him. The Ritemaster remembered that he took the Heart through this portal and made some sort of deal with Nocturnal to hide it safely. I should use the portal and see where it leads. The Ritemaster said he remembered an ancient ruin. I should head toward that and see what's there. This is the ancient ruin where the Ritemaster remembers casting the spell and hiding away the Heart. I should talk to him before he reveals the hiding place. The Ritemaster said the ancient words, but Clavicus Vile and Mephala appeared. We need to defend ourselves from the Daedric horde. Nocturnal appeared, banished the other Princes, and ripped the Heart of Transparent Law from its hiding place inside the Ritemaster's chest. We need to hold on long enough for Valsirenn to finish casting her teleportation spell. 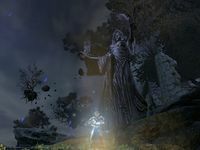 Ritemaster Iachesis is dead, the Heart of Transparent Law is in Nocturnal's hands, the triad of Daedric Princes has been dissolved, and Darien lost Meridia's sword, Dawnbreaker. I need to let Oriandra know everything that happened. Finishes quest I need to talk to Oriandra so we can determine a new course of action in the wake of the Ritemaster's death. This page was last modified on 25 July 2018, at 21:25.